PLEASE READ BEFORE YOU CONTACT US WITH QUESTIONS! Also read this for info on setting up a transmitter. Q: Do you ship to Brazil/Zanzibar/Afrika/Australia/New Zealand......? A: Yes, of course. We ship worldwide. We do however not accept credit cards from Indonesia, especially Java. Q: Do you have a representative in Brazil/Zanzibar/Afrika/Australia/New Zealand......? A: No. But we are looking for distributors so if you wish to become one please drop us a line. Q: How do I become your distributor? A: Contact our sales and ask for info package. Q: I sent you a question but you never replied! A: Please check your e-mail settings. You would be surprised how many people mis-typel their own e-mail address and how many have incorrectly set their e-mail reply-to addresses. We can't help you unless you provide a valid e-mail address and set your reply-to address correctly. It is extremely frustrating to write an extensive answer and see it bounce since e-mail is not valid. Lately, people are using SPAM filters. Quite often such a filter will delete a valid e-mail (ours). Sometimes your ISP installs such a filter without your prior knowledge. MSN is notorious for that. Q: I have no money, please give me a free transmitter. A: We are not a charity organization, but we did send a few free units in extreme conditions, to support democracy in Yugoslavia and some other countries. Your application will most likely be denied. A: Radio data system. Used in most parts of the world except US (lately there as well). It is used to display information, such as time, station name, traffic information, radio text messages.... on the display of your FM receiver. A: Within one (1) year of receiving your order, if any product proves to be defective; please contact us via e-mail or our feedback form. Please DO NOT ship the product back to us without contacting us first and receiving return instructions. After we receive the defective merchandise, we will test it if need be, and we will ship back to you a non-defective replacement product. Please note that this doesn't cover final RF transmitter stage as it can be damaged by using defective or poorly matched antenna. An exception is as well any mishandling or abuse by the customer. If the product is defective, you will receive a replacement. If you choose to return the defective item, rather than replace it, we will charge a 15% restocking fee and your original shipping and handling charges will not be refunded. The return of the product is at your expense. We believe that this is a fair policy because lower overhead results in lower prices for all of our customers. If within fourteen (14) days of receiving your order, you decide you no longer want the product, please contact us immediately via e-mail or our feedback form. Please DO NOT ship the product back to us without contacting us first and receiving return instructions. We will charge a 15% restocking fee and your original shipping and handling charges will not be refunded. The return of the product is at your expense. We believe that this is a fair policy because lower overhead results in lower prices for all of our customers. Q: What if the package is damaged? A: If the packaging appears damaged on the outside, please make sure when signing the shipper's proof-of-delivery slip you include a note stating the package is or appears damaged. Depending on the product and where/how it was shipped, it may be necessary for you to deal with the carrier. Also, if there was any internal (non-visible) damage, this will need to be reported to us or the carrier within two days of receiving the product. Please note that it is not possible to insure and track air mail packages to some countries and we take no responsibility for damaged air mail packages to such countries. Express shipping costs only a few euros more, please consider express shipping! Q: How much is shipping to Zanzibar/Afrika/Australia/New Zealand......? A: Shipping is calculated automatically by our ordering system for every country. If you wish to see how much the shipping is, just go through the ordering process. You don't need to enter credit card details, just make sure you select a check or bank transfer as payment type (so no money will actually be remitted). Think of it as a DEMO version of your future order. You willl see the total displayed on the last page and you can cancel at that point or submit the order to have this total delivered to your email. Note that you haven't paid for anything at this point and we won't ship until you do anyway so you're ok. Your order will be cancelled automatically in 14 days unless we receive payment. Q: How do I pay/order? A: Just fill out the order form, make sure you enter your e-mail correctly. Than press the submit button. You will shortly receive an e-mail with a total and payment details. Q: What types of payment do you support? Q: In what currency will I be charged, what are the exchange rates? A: Our prices are fixed in Euros, all prices are converted to US$ according to exchange rated on the day of credit card authorisation. Exchange rates vary from day to day. Your credit card bill will appear in your local currency. If you want to check current exchange rates for any of the world currencies, visit http://www.pcs-electronics.com/Currency.htm. Q: I am from the US, do I have to pay VAT? A: In short, no. PCS Electronics is a V.A.T (Value Added Tax) registered business, we are obliged by law to collect V.A.T on every product sold within the E.U (European Union). Prices quoted on this website DO NOT include V.A.T. The V.A.T Rate is 20%. If you are outside the EU (For example the USA), you may ignore this V.A.T Notice. So, you do not have to pay VAT! Please contact us if you need any help whatsoever regarding VAT. Q: How much is the shipping for the Antennas? A: Some antennas ship from within the US and could be more expensive to ship to Europe than the website shows, but cheaper to ship to the US. Drop us a line for specific information regarding shipping for the antennas. Q: Type of shipping, air mail or express? A: Air mail is only a few euros cheaper. Note that air mail is not trackable, can not be insured for some countries and is much slower than express shipping. PLEASE CONSIDER EXPRESS SHIPPING SERIOUSLY! It is not possible to insure and track air mail packages to some countries and we take no responsibility for damaged packages to such countries. Express shipping costs only a few euros more, please consider express shipping! A: Air mail usually takes from 1-3 weeks. USE EXPRESS SHIPPING WHEN IN A HURRY! Express shipping takes up to one week. Please don't forget that it often takes a week to process your order and prepare the products. Sometimes even more, if the demand is big or during holidays. Q: Do I have to pay and duties or import taxes? A: PCS Electronics is not responsible for any duties, taxes, or other fees that may be imposed by customs when your package reaches your country. For our mutual protection, all packages are insured for the exact value of your order. We are also unable to provide you with information about duties, taxes, or other fees that may originate in your country. Citizens of the European Union do not have to pay any import taxes. Q: I am from EU; Do I have to pay and duties or import taxes? A: PCS Electronics is based in EU, you do not have to pay any import tax. The only exception are the products shipping from the US (Comet antenna, filters, SWR meter). Q: If I use filters I can put my antenna right next to my neighbor's TV antenna without any problems right? A: Wrong! The low pass filters only attenuate harmonics. If harmonics are not the cause of your problem (they almost never are - our exciters are very clean!) removing them won't help. What causes 99% of all radio interference problems? YOUR FUNDAMENTAL SIGNAL!!! A high power fundamental signal in CLOSE PROXIMITY to ANY type of receiving equipment (TV, radio, telephone, PA system etc.) will blow right past any tuner or filtering on this equipment and enter the amplifier stage along with the intended signal where it will cause interference. This type of interference is called "fundamental overload". All the harmonic filters in the world won't help in this very common situation. What will help? Increase the standoff distance (vertical, horizontal or both) between your antenna and what you are interfering with. This is one of the many reasons high power FM radio station antennas are located on high towers. A 100 KW radio station with a 20' antenna would cause a lot of RFI even though the harmonic levels meet FCC requirements. Q: I want to start a radio station and I know nothing about it! What do I need? A: Hmm, think small and simple for a start. - PCI MAX is perfectly suited for this application. All you need is a PC and PCI MAX card (see under PC FM transmitters). You can even upgrade this package up to 5W later by adding a booster amplifier. You will also need an antenna. And coaxial cable to connect it to the card. A small antenna is included with PCI MAX. See below for range! -CYBER MAX LCD is another perfect starter transmitter. It comes with everything built in, even the RDS encoder, if you want one. It also has built-in power supply so you'll only need antenna to start transmtting. The quality of Cyber MAX LCD exceeds the quality of PCI MAX ULTRA! Q: I'm an advanced user and want more than a simple PC based solution for playing MP3 around the house. I want a stand-alone solution. 1.) FM transmitter (MAX PRO I, MAX PRO II or MAX PRO III, Cyber MAX LCD, Cyber MAX FM...), preferably in an enclosure with stereo encoder. 2.) Power supply, 13.8 - 15V / 2A. This needs to be well stabilised DC power supply, the kind that hams and CB-operators use. You could use car battery as well. Some of the units come with integrated power supply (check product description). Cyber MAX LCD does not need one as it is built in. 3.) Antenna. We recommend COMET or RPL 0205. 4.) Coaxial cable to connect the transmitter and the antenna. Check under accesories on the left. Q: How much range can I expect? PCIMAX: This unit was designed to cover a large house and a yard. However, it has been reported to cover up to about 3/4 of a mile. a) Optical visibility. This can sometimes be up to 40 miles, if you are looking out from a mountain top. b) Interference from other stations on the same or close-by frequency. c) Transmission power. Even if optical visibility is 20 miles, 1W probably won't get you more than a mile. If 50 Watt ERP is used, it's very likely that 20 miles of range will be achieved. This is because 50 Watt ERP is ample power to propagate a strong signal 20 miles. If 1 Million Watts of power is used, it is very likely that signal will only propagate just over 20 miles. This is because the range is limited as described in point a) above. It is not normally possible to have hundreds of miles of range on FM broadcast band (87.5MHz to 108MHz), even if terrain is perfectly flat and you have your antenna on the top of the mountain and you're using killowatts of power. It is occasionally possible due to special atmospheric conditions, such as inversion etc. Such special conditions happen rarely and only last for a very short time so it is not possible to rely upon them in any way. In order to cover so many square miles it is necessary to setup a grid of transmitters and link them via wireless audio links, making sure they do not transmit at the same frequency as they could interfere. Q: Is PCI MAX stereo? A: Yes, PCI MAX IS STEREO! Q: Can I connect RDS MAX to PCI MAX to make it RDS capable? A: Yes, instructions are included with every RDS MAX. Q: Can PCI MAX transmit any PC audio including Internet radio, either Real Player or Windows Media, or is this strictly for use with MP3 files? Looks like a nice product. B: Absolutely. It will transmit anything your sound card plays. You can transmit "Everything" audio. You can even connect it to an external MD player, CD player, cassette deck, turntable, audio mixer......The sky is the limit. Q: Do I need an external power supply for PCI MAX? A: No, it is entirely powered by the PC. If you choose to use the 5W amplifier, you can use the power supply provided with the booster to power PCI MAX. Note that this eliminates most of the noise originating from the PC. You can also buy your own stabilized DC power supply (13.8V / 1A) to pow. They are available from radio shack or electronics/CB/ham stores. Q: What is the range of PCI MAX? 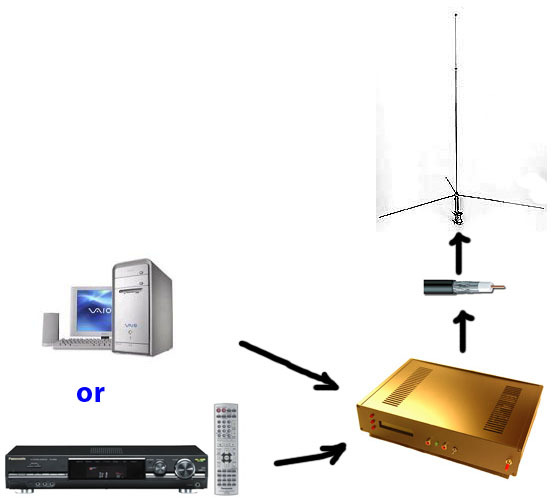 A: High power setting will cover the house and a large yard, with external antenna possibly up to half a mile. With 5W amplifier you are likely to cover about 1- 5 miles, depending on antenna and terrain configuration. Q: Tell me more about the 15W amplifier! A: This is actually a two-stage unit with a high quality low pass filter at the output. Harmonics are at least 60dB under the carrier. You are advised to consult the legal limitations in your country before you attempt to use it. Q: Where is the driver? Q: Do you have any cool DSP programs for PCI MAX? Q: I can't get it to install, no matter what I do! A: Check the support section, there is a new section dedicated to reporting problems and installing PCI MAX ULTRA. A: It seems that some problems just can't get it to work under Windows 2000. We recommend using Windows XP, Windows 98 or NT in all such cases..
Q: What is the difference between MAX PRO I and MAX PRO II? A: MAX PRO II basically provides the same functionality, but does not have LCD display. In order to set the frequency you need to setup jumpers. Also, MAX PRO II does not have the tuning facility so you have to use a V-meter to set it for maximum power. Q: What is the difference between MAX PRO I and MAX PRO III? A: MAX PRO III is an entirely different beast. It has been redesigned and upgraded to offer more power, no-tune wideband operation, SWR and temperature protection, extremely high grade of RF field immunity etc. In short, MAX PRO III is a much better transmitter. A: You need a stabilised DC power supply. 13.8 to 15V at 2A should be enough for MAX PRO I or MAX PRO II. MAX PRO III requires a stronger power supply, up to 4A. You can get that either from us (see accesories on the left), Radio Shack or any HAM shop. Q: What is the range of MAX PRO I, II and III? A: It really depends. Anywhere from 1 mile to 20 miles, depending on your transmitting position, your antenna and terrain configuration. Its really hard to predict range without doing an actual testing. MAX PRO III has 50-100% more range when compared to the two younger brothers. Q: Can I increase power/range? A: Yes, you can add an amplifier to any version of our MAX PRO transmitter. Make sure your amplifier has a low pass filter at the exit. You are advised to consult the legal limitations in your country before you attempt to use it. Q: Do I have to use an output RF filter? A: MAX PRO I, II and III have pretty good filters at the output making an extra filter basically unnecessary. However, some people will tell you that you can never have too much filtering. Its up to you to decide. If you're living in a densely populated area, you may opt for more filtering just to be sure. But it is not necessary. Q: How do I make my old MAX PRO stereo? A: Just order SE-3 or even better SE4 stereo encoder and hook it up to MAX PRO ...easy. Don't forget to disable preemphasis. Q: What is the difference between the units in an enclosure and without enclosure (assembled)? A: Technically there is no difference. But its hard to find an enclosure with a suitable LCD aperture. And all units in an enclosure are properly matched with the stereo encoder (levels are properly adjusted). And they look much better. Q: Can I make an antenna myself? A: Check the guides on the left, there are a few designs. Antenna is the most important factor as far as range is concerned, bad antenna will give you poor range even with a huge power output. Q: Hello, I found your website while searching for an FM stereo transmitter solution that I might put on my boat so that when we have rafting parties with a bunch of friends (on their own boats) that we can all listen to the same music. Do you offer a solution that would allow me to plug in an audio source (such as a CD player) and broadcast it up to maybe a quarter mile to my friends radios? A: Sure, check any of our transmitters. Perhaps PCI MAX with that LED module or MAX PRO I, II or III with stereo encoder. I'd use Comet antenna with these. Range on the water should be excelent. Remember that the transmitter takes 12-14V at 1.5A. PCI MAX has lowest power consumption of the lot. Q: I am consultant to a childrens home campus. It is a campus of about one square mile. They wish to put in a low power radio station to serve just the campus. It will be run by the campus children about two hours an evening. I wish to know if your products may be suitable for this. Broadcasting will include music, interviews, and chit chat. I am use to dealing with large commercial broadcast facilities and have never put anything like this campus station together. Can you be of help? A: Sure, check MAX PRO II stereo or MAX PRO I stereo. I'd use Comet antenna with these. Remember to order the power supply as well as the transmitter takes 14V at 2A. Criminals who tried to use stolen credit cards to purchase at our website, they did not receive the merchandise; their names were forwarded to Interpol and credit card company and are now easily found along with this notice by anyone using Google.